Hello and welcome to the 285th installment of the SWD. Syrian Salvation Government, which operates in Hayat Tahrir al-Sham-held areas in Idlib governorate, opened a police station in the city of Binnish. Syrian Salvation Government’s Minister of Interior, Ahmed Nuri Mohammed Deeb attended the opening ceremony. Hayat Tahrir al-Sham captured Tell Abu Khanadiq from the Islamic State in the northern Hama. Islamic State captured the locality from Hayat Tahrir al-Sham at the beginning of December. Russian Air Force conducted four air raids over the villages of Al-Tafahiah and Buyud in the eastern Hama. Syrian Arab Army’s artillery shelled Ain Terma and Kafr Batna in the East Ghouta. 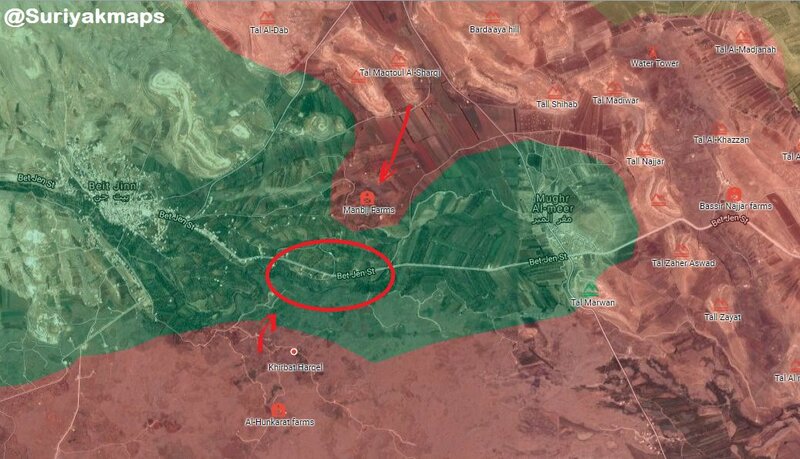 Syrian Arab Army reportedly captured Tell al-Kharoub from the rebel Jabal al-Sheikh operations room near Beit Jinn farms, in Beit Jinn pocket. Syrian Arab Army’s artillery shelled rebel-held Al-Naimah. Free Syrian Army and IS-linked Jaysh Khalid ibn al-Walid clashed in the Yarmouk basin area, as the former shelled latter’s positions in the area. Improvised explosive device exploded on the road between Bosr al-Harir and Musika, wounding three people. Rebel “Daraa Martyrs Documentation Office” reported death of a Free Syrian Army’s fighter, due to the wounds sustained during the clashes with the Syrian Arab Army in Al-Manashiyah neighborhood of Daraa. Islamic State-linked Jaysh Khalid ibn al-Walid publicly executed a Free Syrian Army’s fighter in Nafea. The executed fighter belonged to the Tajammu al-Shahid Abu Hamza al-Naeimi and was captured in the September. Iraqi Army’s 11th Infantry Division arrested several crude oil smugglers, after ambushing them in Al-Rashadiyah area, northeast of Baghdad. Iraqi forces also seized a vehicle used to transport crude oil. Afghan National Security Forces conducted operations against the Islamic Emirate of Afghanistan (Taliban) in Khaja Sahib Posh district, killing eight and wounding seven elements of the group. Afghan National Security Forces arrested four elements of the Islamic Emirate of Afghanistan in Balkh district. Afghan National Security Forces arrested a suicide attacker planning to carry out an attack against the Afghan government’s institutions in the city of Mihtarlam, the capital of Laghman Province. The arrested suicide attacker was reportedly disguised in women’s clothing. Islamic Emirate of Afghanistan’s improvised explosive device killed an element of the Afghan Local Police in Alishing district. Afghan National Security Forces conducted operations against the Islamic State in Ghani Khel district, killing five elements of the group, including one of the local commanders. Islamic Emirate of Afghanistan ambushed Afghan National Police in Ghani Khel area, destroying a vehicle and killing three elements of the police. Islamic Emirate of Afghanistan stormed Afghan National Army’s checkpoint in Qali Zardak area of Dara Boum directorate, forcing the latter to withdraw from it after allegedly sustaining heavy clashes during the clashes. Islamic Emirate of Afghanistan seized a motorcycle and five boxes of ammunition from the checkpoint. Islamic Emirate of Afghanistan’s sniper killed one and wounded another element of the Afghan National Army in Ab Garmak area of Ghormach district. Islamic Emirate of Afghanistan captured Afghan National Army’s checkpoint in Chaghto directorate, killing and wounding several soldiers in the process. Islamic Emirate of Afghanistan’s improvised explosive device destroyed Afghan National Army’s vehicle in the city of Ghazni. Islamic Emirate of Afghanistan ambushed Afghan National Army’s infantry in the city of Ghazni, killing two soldiers and seizing two assault rifles. Islamic Emirate of Afghanistan’s snipers killed three Afghan National Army’s soldiers across the city of Ghazni. Furthermore, Afghan Local Police’s element was also killed by an IEA sniper near a checkpoint in Deh Yak district. Islamic Emirate of Afghanistan’s improvised explosive device destroyed Afghan National Army’s tank in Shamalgah area of Farah city. Furthermore, in Chakab area of Farah city, another Islamic Emirate of Afghanistan’s improvised explosive device killed an element of the Afghan National Police. Islamic Emirate of Afghanistan raided district administration center of Anar Dara, under the control of the Afghan National Police. Clashes between the two lasted for two hours, during which one element of the Afghan National Police was wounded and additional two wounded. Islamic Emirate of Afghanistan’s improvised explosive device destroyed Afghan National Army’s armored personnel carrier in Khwaja Baba area of Shahr-e-Safa directorate. The explosion killed five soldiers on board. Islamic Emirate of Afghanistan ambushed Afghan National Security Forces’ logistical convoy in Lakh Shakano area of Delaram directorate. The ambush resulted in destruction of two fuel tankers. Afghan National Security Forces conducted operations against the Islamic Emirate of Afghanistan in Marjah district, killing four fighters of the group and destroying two motorcycles, weapons depots and ammunition caches. Islamic Emirate of Afghanistan launched several attacks against the Afghan National Security Forces’ reinforcements that arrived in Terikh Nawar and camp areas of Marjah districts. Several Islamic Emirate of Afghanistan’s improvised explosive devices also targeted the aforementioned troops. According to the Islamic Emirate of Afghanistan, 22 ANSF‘s elements were killed, two armored vehicles destroyed and one vehicle seized. Islamic Emirate of Afghanistan ambushed Afghan National Security Forces’ reinforcements heading towards Wandoz area of Arghistan district. The clashes between the two sides resulted in killing of six ANSF‘s elements and injury of three IEA fighters. Islamic Emirate of Afghanistan seized two vehicles, four assault rifles and six pistols.